To me, one of the best parts about travel (and life in general) is those unforeseen moments that bring joy, connection, calm, revelation—moments when you step outside your plans or routine and make new discoveries, whether about yourself, your surroundings or others. 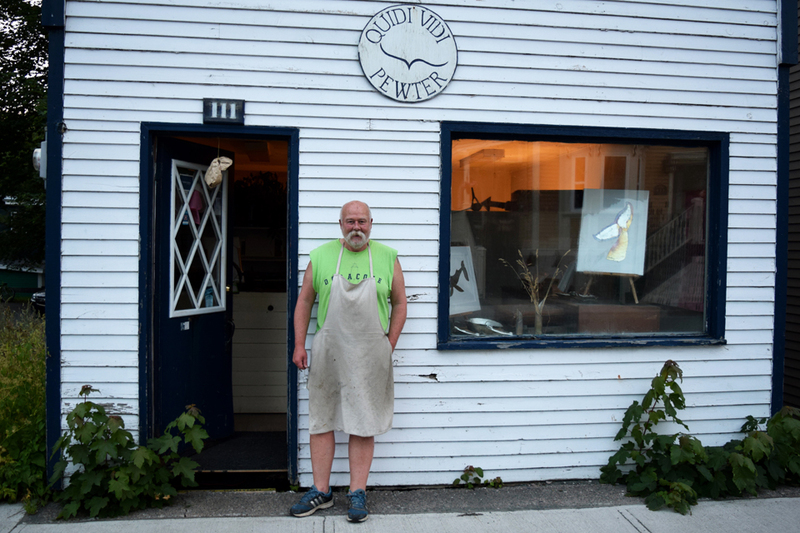 I found all of that last summer on my first trip to Newfoundland and Labrador, when I stepped inside Ray’s pewter workshop in the Quidi Vidi neighbourhood of St. John’s. I was on the lookout for his workshop but had been warned that he kept irregular hours, so not to get my hopes up about finding him. We lucked out. When we came upon his studio, he was hard at work in the small, hot space, packed full of pewter creations—whales, bowls, figurines, all somewhat abstract and made with his trademark oil-spill palette. We’d tracked him down in the hopes of buying a piece of his art. What we got was a piece of his story. Ray put down what he was doing to create a custom craft for us. And while he worked, he invited us in to watch his process and learn how his life had led him to that cramped but cozy workshop in gorgeous Quidi Vidi. It was a beautiful evening, a moment out of time. Thank you, Ray. I love the paper bag hung in the doorway. You see it a lot in Newfoundland; is it done anywhere else? It’s there to keep flies out, they think it’s a wasp nest. Hey Andrew, me too! I asked Ray about it and he had some smart aleck reply about how it was there to get people to ask about it. 😉 Then he explained about the resemblance to a wasp’s nest. That was the first time I’d seen it but I’m guessing people in other parts might use the tactic, too. Andrew, I saw another paper bag “wasps’ nest” in Ottawa today. They are done elsewhere!